Bolivia is one of the world’s smallest contributors to the emissions which cause climate change. It is responsible for 0.04% of global carbon emissions compared to the UK’s 1.87%. Yet the effects of climate change are already a reality in Bolivia. This has led Bolivia to play an increasingly forceful and prominent role in international climate change negotiations. There are environmental and social impacts of climate change across Bolivia’s diverse regions from the Andean highlands to the Amazonian lowlands. It is the communities that are already in situations of poverty and vulnerability that are feeling the effects hardest. Five of the main impacts of climate change are: food insecurity; glacial retreat and water availability; natural disasters; diseases and forest fires. Rises in near-surface temperatures have tripled since the mid 1970s. This has led to rapid glacial melt in the Bolivian Andes. In the Cordillera Real, the country’s main mountain chain, glaciers have decreased by 40% of their total volume from 1975 to 2006. This has significant effects on water supply as well as electricity produced by hydropower. The Tuni Condoriri glacier, which provides the water supply for Bolivia’s administrative capital La Paz and the neighbouring city of El Alto (together accounting for around 2 million people), is expected to disappear partly by 2025 and fully by 2045. Climate change is affecting the frequency and severity of extreme natural events such as flooding and forest fires. In the Amazonian lowlands flooding has become more frequent and its effects increasingly widespread. Flooding between 2006 and 2008 affected over 1 million people in a region where 32% of people live in poverty and are particularly vulnerable to natural hazards. Meanwhile forest fires - caused by drought - have also become more severe. In the Amazonian departments in 2010 fires affected 1.5 million hectares of land. Increases in temperatures have had health implications. Certain types of mosquitoes have adapted to living at altitudes above 2,600m, leading to increased risk of contracting diseases. Cases of malaria have been identified for the first time in the highland city of Oruro. In the longer-term one of the main concerns is food insecurity. Changing temperatures, increasing irregularity of seasons and overall unpredictability of weather have significant implications for food production. Whilst the changes vary according to region and climate, small producers and subsistence farmers are worst affected. In 2010 sudden drops in temperature and drought resulted in the death of livestock and reduction of crops which affected 21,000 families in the Amazon departments. In 2011 climatic instability caused Bolivian quinoa yields to drop 50% compared with the previous year. Livelihood insecurity will also affect migration patterns. Migration has always been a way of sourcing alternative incomes in the Andes where agricultural cycles are dictated by dry and rainy seasons. It’s hard to identify climate change as the cause of migration as decisions to move are often complex, however, the effect of environmental instability on livelihoods is likely to be a strong factor. In Norte Potosi, a region in which 71% of the land is affected by desertification, recent research indicates that migration is becoming more widespread. On average 15% of communities’ populations in the area migrate each year, though in some communities the rate is as high as 50%. In the face of environmental and socio-economic adversity Bolivian people are responding and adapting to climate change constructively. The Bolivian Climate Change Platform is led by the Secretaries of Natural Resources of the five main Bolivian social movements who collectively represent over three million people. They receive technical support and funding from Bolivian and international non-governmental organisations. The Platform was founded in 2009 as it was recognised the country was being increasingly affected by the impacts of climate change. The aim of the Platform is to develop proposals to combat climate change through national policies in Bolivia and proposals for international action. At the national level, the Platform has been active in promoting the Law of Mother Earth. 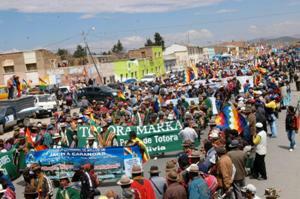 The law is based on a proposal drafted with grassroots participation from Bolivia's five main social movements. The overall aim of the law is to transition towards a model of living in harmony with nature by shifting to renewable technologies and applying indigenous ancestral knowledge in sustainable management of the environment. The Law establishes mechanisms such as a Ministry of Mother Earth and an environmental ombudsman to protect environmental rights. The Secretaries of Natural Resources regularly participate in the UN climate change negotiations promoting international policies grounded in indigenous values including the Rights of Mother Earth and based on the conclusions of the World People’s Conference on Climate Change (see below). Called in response to the perceived inadequacy of the 2009 UN Conference in Copenhagen, the World People’s Conference took place in the Bolivian city of Cochabamba and coincided with Mother Earth Day on 22 April 2010. The indigenous concept of vivir bien – living well and in harmony with one another and nature (as opposed to living better than and in competition with others) - was prominent within the ethos and approach of the conference. The conference brought together 35,000 people (of which 9,000 were from outside Bolivia) from social movements, governments, scientists and academics. Discussions went beyond the impacts and effects of climate change to identifying its structural causes. The results of the conference were presented and collated into a document entitled the “People’s Agreement”. The Agreement calls for emissions to be reduced so that the world’s average temperature is only increased by a maximum of 1 degree Celsius. To account for developed countries’ historical responsibility and the climate debt they have accrued it suggests that they should give 6% of their respective GDPs to climate adaptation funds. These would be managed by national governments at the UN, not the World Bank. There were more detailed proposals for specific areas such as sustainable agriculture and forestry; technology transfer; supporting those who are forced to migrate due to climate change; the need for an International Climate and Environmental Justice Tribunal and a Universal Declaration of Mother Earth’s Rights. The Bolivian government has taken a strongly principled position in the UN climate change negotiations, taking its policy line from the conclusions of the WPCCC. The Bolivians have pushed for a binding, ambitious and justice-based agreement from the discussions, often putting it at odds with industrialised countries which have proposed more pragmatic, less ambitious outcomes. The Bolivian government has been successful in gaining recognition for access to water as a human right at the United Nations and is also pushing for the approval of the Universal Declaration of Mother Earth’s Rights.